The ultimate travellers power pack. 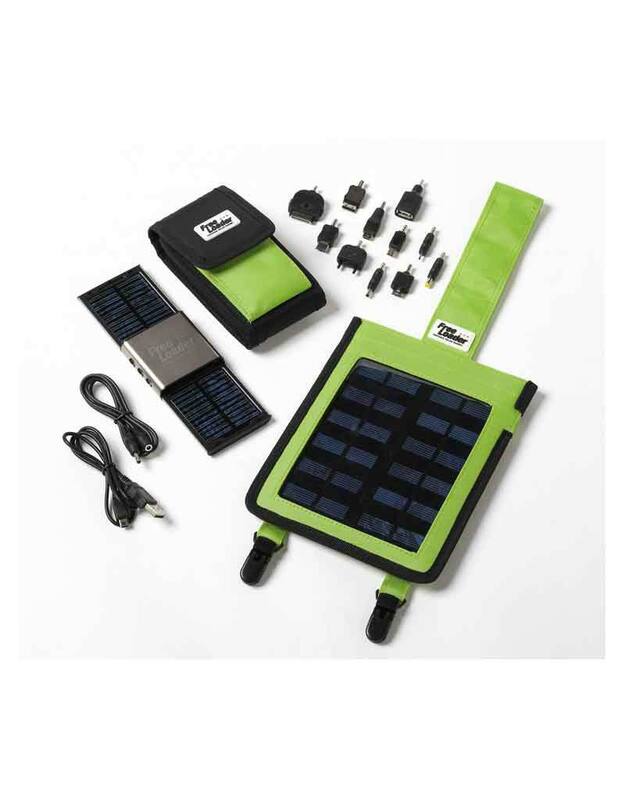 Globetrotter is a complete mobile power solution built around the Freeloader Portable Solar Charger. The Kit not only inclues a Freeloader but also eleven connectors and connection cables, a Freeloader Supercharger (which is suitable for use in all weathers), super fast charging and a tough carry pouch to protect the Freeloader in the most hostile of environments. Freeloader is an advanced portable charging system that can power any hand held device anywhere, anytime. Freeloader takes power from its solar panels, the supplied Supercharger or via its charge cable that plugs into a computers’ USB. Once charged, Freeloader’s internal battery can power an iPod for 18hours, a mobile phone for 44 hours, PSP for 2.5 hours a PDA for 22 hours and much much more. The Freeloader is even compatible with the new iPhone, iTouch, iPod Classic and all earlier iPods. The kit also now comes with an adaptor to power all iPod applications. The Freeloader, with its tough aluminium body, is one of the toughest chargers on the market and like a platinum wedding ring every knock and scratch will be memory of that great adventure you had - for those who want to keep them in pristine condition simply use the included pouch. The Globetrotter Kit is also supplied with a Supercharger, which is a super tough, super fast means to charge a Freeloader. It can simply clip to your backback or bike bag and then charge your freeloader while the main body is packed away safely. The Supercharger will fully power up a Freeloader in as little as 4 hours in sunshine, which means it is possible to charge Freeloader twice in one day! Just plug into the Freeloaders hub for instant performance. •	1000mAh environmentally friendly Li-ion battery – typical battery life is 2 years. •	Impact resistant, rust free aluminium body. Does this work on a iPhone 5s and does it have an adaptor for this? This does work on an iPhone 5s. You would need to use the white cable that came with your iPhone and the female USB connector in the pack.